Objective/Background: Clinical diagnosis of indeterminate and tuberculoid leprosy is often difficult due to limited and confounding signs and symptoms. In the current study, we evaluated the utility of new multiplex polymerase chain reaction (PCR) using Mycobacterium leprae-specific DNA sequences in the pseudogene regions of ML1545, ML2180, and ML2179 for PCR-based diagnosis of indeterminate leprosy (IND) and leprosy cases across the immunological spectrum. The sensitivity was compared with that of RLEP PCR. Methods: DNA was extracted from paraffin-embedded skin biopsy specimens of 220 leprosy cases, which were divided into IND (41), tuberculoid form (3), borderline tuberculoid (42), midborderline (3), borderline lepromatous (n=59), and lepromatous leprosy (72) cases. PCR positivity of both multiplex and RLEP PCR were compared in all the samples. A decision tree was constructed using the classification and regression trees algorithm to predict the probability of PCR positivity with the new multiplex PCR scheme in various clinical groups of leprosy. Sensitivity of each pseudogene target was determined using real-time PCR assays, and specificity was confirmed by PCR amplification of DNA extracted from three other mycobacterial species and skin biopsies of 44 non-leprosy cases. Results: A multiplex PCR positivity of 75.61% was noted in IND cases when compared to that of 58.54% using RLEP PCR (P < 0.05). Enhanced multiplex PCR positivity was noted across various clinical groups in comparison to RLEP PCR. The decision tree classifier has predicted statistically significant probability for multiplex PCR positivity among RLEP-PCR negative group and clinical groups with a low bacillary load. Conclusion: This new multiplex PCR scheme can support the diagnosis of indeterminate and tuberculoid forms of leprosy with limited clinical manifestations and can be implemented in basic clinical/diagnostic setting that possess conventional PCR facilities. Mycobacterium leprae, an obligate intracellular bacillus, causes leprosy in ~220,000 cases each year globally. The disease mainly infects the skin and the peripheral nerves, and follows an immunological spectrum. The World Health Organization (WHO) has introduced a field-based system of classification where cases with five or less skin lesions were considered as paucibacillary (PB) and those with more than five skin lesions were considered to have Multibacillary (MB) disease. Immunohistopathological classification of the disease (Ridley–Jopling classification [RJ]) is characterized by a self-limiting tuberculoid pole (TT) with predominated cell-mediated immunity and a low bacillary load that gradients through three unstable borderline forms (borderline tuberculoid, midborderline, and borderline lepromatous) to a more granulomatous form of disease called the lepromatous leprosy pole. This pole is characterized by increased humoral immunity and a high bacteriological index (BI). There are certain forms of leprosy that are classified outside this immunological spectrum, namely, “pure neuritic leprosy” and indeterminate leprosy (IND). Pure neuritic leprosy is manifested by the involvement of peripheral nerve trunks without the occurrence of skin lesions. Clinical diagnosis is based on sensory testing and nerve conduction assessments. Characteristic nerve thickening and muscle weakness are usual signs. By contrast, IND is a macular form of the disease, which is characterized by one or few of the hypopigmented macules without defined borders. Loss of sensation is noted in some cases and the BI is mainly negative. Histopathological examination of the skin sections indicate mild infiltration of lymphocytes around the dermal blood vessels, rare occurrence of intraneural or perineurial inflammation and granulomas. Bacilli are rarely seen in the nerve bundles. Diagnosis of this form of leprosy is often difficult for clinicians from primary and secondary care leprosy centers where histopathology facilities are generally absent. A robust laboratory-based diagnostic test is required to confirm a case of IND. Polymerase chain reaction (PCR) has been used as an effective tool for determining the presence of M. leprae DNA in skin specimens of difficult-to-diagnose leprosy cases. PCR was identified to be a useful assay for the diagnosis of pure neuritic leprosy with 50%–70% sensitivity.,, Multiplex PCR has been used as an alternative and a sensitive technique for the determination of M. leprae DNA in the contacts of leprosy cases in earlier studies., It has also been noted that the same multiplex PCR could enable detection of M. leprae DNA in approximately 80% of the PB and 89% of the MB leprosy cases. In the current study, we investigated the utility of novel multiplex PCR assay using M. leprae-specific pseudogene targets located within ML1545, ML2180, and ML2179. There is no mRNA transcript or protein information available for these sequences in the standard databases of the National Centre for Biotechnology Information (NCBI). PCR positivity was determined by the detection of at least one of the three pseudogene targets in the clinical samples using multiplex PCR. 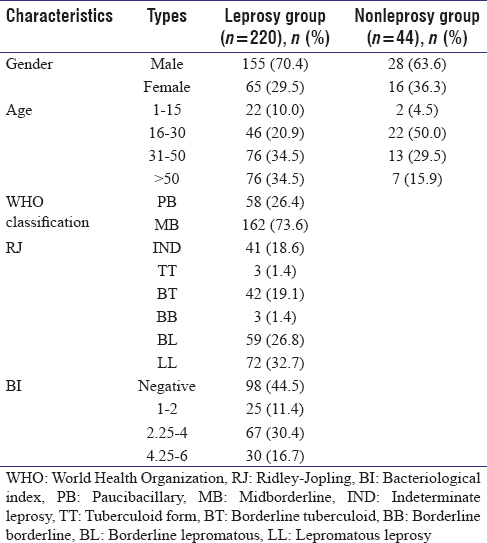 DNA extraction and PCR tests were performed on clinical isolates of 220 newly diagnosed untreated leprosy cases who reported at the Dermatology Outpatient Department of Schieffelin Institute of Health Research and Leprosy Centre – Karigiri in Vellore, Tamil Nadu, India, during the period 2012-2015. Samples were collected from all the participants before the initiation of multidrug therapy (MDT), and informed consent for participation was obtained during sample collection. In case of participants being children, informed consent was obtained from the parent/guardian prior to sample collection. Clinical, demographic, and immunohistopathological characteristics were recorded at recruitment [Table 1]. In addition, 44 nonleprosy cases (with skin diseases other than leprosy), who reside in a low endemic area and do not demonstrate evidence of direct contact with an active leprosy case, were enrolled as controls after obtaining informed consent for participation. DNA extracted from Mycobacterium smegmatis, Mycobacterium tuberculosis, and Mycobacterium phlei was used as an internal control to ensure the specificity of the multiplex PCR. Experiments were conducted in conformity with the guidelines of the Institutional Ethical Committee and ethical standards as laid down in the 1964 Declaration of Helsinki and its later amendments or comparable ethical standards. Medical diagnosis was performed by a clinician/leprologist. The ethical approval number is SIHRLC/KRC/MBR-004/NT. A part of the paraffin-embedded skin biopsy specimens that were prepared for routine histopathological examination (for determining the type of leprosy) were used in the current study. RJ and BI were recorded at diagnosis for all the participants. DNA was extracted from the paraffin-embedded skin biopsy specimens following the protocol as described earlier by de Wit et al. Briefly, the sections were melted at 65°C for 10 min and incubated with xylene for 30 min to remove paraffin wax. The suspensions were centrifuged at 10,000 rpm, and supernatants were discarded. The pellets were washed with 100% ethanol, air dried, and used in the lysis protocol. A volume of 200 µL of lysis buffer (containing 100 mM Tris buffer at pH 8.5, 1 mg/mL proteinase K, and 0.05% Tween 20) was added to the pellet in a 1.5 mL microcentrifuge tube, vortexed thoroughly, and incubated at 60°C for 16 h on a water bath (Polystat; Cole Parmer Inc.). Post incubation, proteinase K was deactivated at 95°C (15 min). Later the lysate was allowed to cool to room temperature, and DNA was eluted using phenol chloroform extraction. DNA extraction from cultures of M. tuberculosis, M. smegmatis, and M. phlei was performed using DNeasy Kits (Cat. no. : 69506; Qiagen Inc., Germany) as per the manufacturer's instructions. M. leprae-specific genomic DNA sequences in the pseudogene regions of ML1545, ML2180, and ML2179 were identified as described earlier. Pseudogene regions were chosen owing to their uniqueness to M. leprae genome and are absent in any other mycobacterial species. Primers were designed using Primer BLAST version 3 from the NCBI [Table 2]. The designed primers were obtained commercially from Eurofins Scientific Inc., Germany. PCR amplifications were compared with those of RLEP gene region whose primers were taken from earlier reports  [Table 2]. PCR amplifications were performed in a conventional thermal cycler (PTC 150 Minicycler; MJ Research). PCR Reaction mix (20 µL) was prepared using 10 µL of Multiplex Master Mix (Cat. No. : 206143; Qiagen Inc.), 0.5 µL each of forward and reverse primers for each of the pseudogene targets (ML1545, ML2180, and ML2179), 5 µL of nuclease free water and 2 ng of DNA. The reaction conditions included initial denaturation at 95°C for 15 min. This was followed by 40 cycles of 94°C for 30 s, 61°C for 1 min 30 s, and 72°C for 1 min 30 s. The reaction was terminated with a final extension of 72°C for 10 min, and the tubes were cooled to 25°C. Amplicons were electrophoresed on a 2% agarose gel, and gel images were captured using gel documentation systems (Vilber Lourmat Inc., Denmark). PCR for RLEP was performed as described earlier. DNA extracted from the M. leprae strain Br4923 (Courtesy: BEI Resources; Cat. No. : NR-19351) was used as a positive control in the experiments. A representative set of amplified DNA fragments were purified from agarose gels and were sent to a commercial facility (SciGenom Labs Pvt. Ltd., India) for Sanger sequencing to confirm the sequences of ML1545, ML2180, and ML2179. All the PCR reactions were performed in duplicates by two independent researchers to establish the reproducibility. DNA was extracted from pure cultures of M. tuberculosis (provided by the Department of Microbiology – CMC Vellore), M. smegmatis, and M. phlei. Multiplex PCR and RLEP PCRs were conducted using the above-mentioned PCR conditions. Presence of DNA in the samples was confirmed through the amplification of the rpoB gene region in all three species using primers and PCR conditions as specified for M. leprae. Genomic DNA of M. leprae strain BR4923 (Biodefense and Emerging Infections Research Resources Repository, BEI Resources, VA, USA) was serially diluted from 200 to 6.25 fg  (quantity of DNA equal to 2 bacterial cells considering 3.2 Mbp genome of M. leprae), and real-time PCR was performed in triplicates for each dilution using 10 µL of QuantiTect SYBR Green PCR Master Mix (Cat. No. : 204143; Qiagen Inc.), 0.5 µL each of forward and reverse primers (10 µM) for RLEP, ML1545, ML2180, and ML2179, and 7 µL of nuclease-free water. The reactions were cycled at 95°C for 10 min for one cycle, 94°C for 30 s, 61°C for 45 s, and 72°C for 45 s for 40 cycles followed by melting curve analysis from 72°C to 95°C to determine nonspecific amplifications. Experiments were performed on a Rotor Gene-Q 5Plex HRM real-time PCR system (S No. : R04114139; Qiagen Inc.), and data were analyzed using Rotor Gene Q series software. Data were acquired on the green channel during the annealing phase. Salford Predictive Modeling Suite (classification and regression trees [CART]) version 2015 was used to construct a decision-based classifier tree to predict the probabilities of PCR positivity of the multiplex PCR scheme in various clinical groups where RLEP PCR indicated varying sensitivity. Raw data were submitted to the interface as a comma limited data tables which were considered as training and evaluation sets by the CART decision tree analysis engine. A model was generated using PCR positivity of multiplex PCR as a logistic binary target variable. Categorical variables (RJ, WHO classification, and RLEP PCR) and continuous variable (BI) were considered as predictors in the model construction. From the model, decision trees were calculated with different minimal cases of which a tree with the lowest relative cost and a high area under the receiver operating characteristic (ROC) curve were chosen and analyzed on the CART navigator. The size of the decision tree is manually optimized based on the relative cost curve. Each node in the tree represents a specific class that divides until a point where predictor variables carry the least supporting data. The generated model was validated with a cross-validation algorithm from the CART navigator using 10-fold validation method. This was performed to eliminate overfitting of the data. The sample set was subdivided into 10 subsets, and each subset was evaluated considering one of the subsets in the group as a test set. This process was repeated 10-fold until all the subsets were considered at least once as a test set in each of the validations. The averaged ROC curve from the models, was used as an indicator for the overall performance of the algorithm being used. Statistical analysis was performed using GraphPad Prism 6, GraphPad Software, Inc. CA, USA. Chi-square tests were performed between the groups to ascertain statistical significance in associations. An association with P < 0.05 was considered as statistically significant. In the view of identifying a sensitive and specific tool for the detection of M. leprae DNA in patient samples, multiplex PCR was considered as positive if at least one of the three gene targets ML1545, ML2180, and ML2179 was amplified in each of the patient sample. Out of the 220 leprosy patients who were enrolled in the study, 163 were positive for all the three targets ML1545, ML2179, and ML2180; 201 were positive for ML2179 and ML1545; four were positive for ML1545 only; and there were no samples in which only ML2179 and/ or ML2180 was positive [Table 3]. Hence, a total of 205 patient samples were positive for M. leprae DNA out of 220 (93.2%). By comparison, M. leprae DNA was detected using RLEP PCR in 74.5% of the cases (P < 0.05). The multiplex PCR scheme was also effective in the detection of M. leprae DNA in 95.2% of borderline tuberculoid leprosy cases when compared with RLEP (54.8%; P < 0.05). Similar observations were noted in the group classified as BI negative where 87.8% of the cases were positive by multiplex PCR in contrast to 53.1% cases by RLEP PCR (P < 0.05). However, no statistically significant difference was noted in the lepromatous leprosy group where both the PCR assays indicated identical sensitivity in cases with a high bacillary load. Hence, these observations signify the utility of the multiplex PCR scheme in the diagnosis of leprosy cases with minimal bacillary load [Table 4]. The new multiplex PCR scheme was tested for its sensitivity using individual real-time PCR assays for each of ML1545, ML2180, and ML2179 pseudogene targets using standard DNA of M. leprae (obtained from 2-fold serial dilutions in the range of 200–6.25 fg). The critical threshold (CT) values of fluorescence were recorded for all standard DNA dilutions with a negative cutoff value of >35. The values were normalized with those of RLEP real-time PCR assay using the same standard DNA dilutions and are represented in [Table 5]. From the CT values, it is evident that M. leprae DNA was detected in as low as approximately two bacterial cells. The specificity of the gene targets was determined by multiplex PCR of DNA isolated from slit skin scrapings of 44 nonleprosy cases and three other mycobacterial species (M. tuberculosis, M. smegmatis, and M. phlei.). These were negative in normal PCR and had critical threshold values of >38 in real-time PCR. Similar observations were made with RLEP, indicating that RLEP as well as gene targets in the multiplex scheme are specific to M. leprae. M. leprae DNA was detected in 75.6% of the IND cases using multiplex PCR, which is one of the important observations in the study. PCR amplifying the RLEP gene region has also detected 58.5% of the cases as positive. The comparison indicated a statistically significant difference between both the PCR assays (P < 0.05) While 46.3% of cases were positive in both RLEP and multiplex PCRs, 12.9% did not show any amplification with either of the PCR assays, although histopathology reports indicated characteristics of IND in the local skin tissue. A comparison of PCR positivity between multiplex PCR and RLEP across all the leprosy cases involved in the study indicated that 70.4% of the cases were positive and 2.7% were negative in both the PCR schemes. While 4.1% of those cases that were not detected by multiplex PCR were detected by RLEP, 22.7% of the cases that were not detected by RLEP PCR were detected by multiplex PCR [P < 0.05; [Table 6]. A representative set of 30 PCR amplicons, which are negative for RLEP and positive for all the three gene targets of multiplex PCR, were sent for DNA sequencing (Sanger sequencing), and sequence analysis using nucleotide BLAST revealed that the sequences corresponded to ML1545, ML2179, and ML2180 as predicted by Primer Blast version 3. The 129 bp sequence of RLEP used in the current study was also confirmed by Sanger sequencing of 10 RLEP-positive PCR amplicons. A decision-based classification tree was created on the CART navigator with PCR results of RLEP as the root node, which diversified based on clinical characteristics such as RJ, WHO classification, and BI. 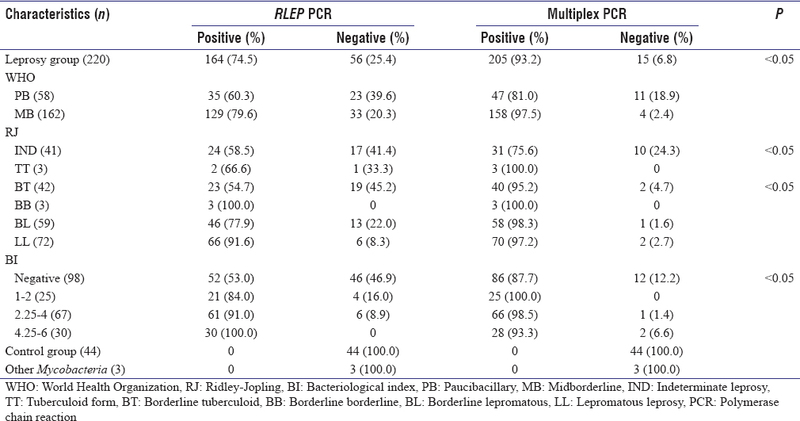 Probabilities of multiplex PCR positivity in groups rendered as RLEP PCR negative and positive were represented, and are further subdivided into groups with low bacillary load and tuberculoid spectrum of the disease towards the left and high bacillary load and lepromatous type towards the right. The tree was constructed with a relative cost of 0.576 and an area under the ROC curve of 0.7956. While the current multiplex PCR scheme can detect RLEP PCR-negative samples with a probability of 89.3%, samples with borderline tuberculoid, TT, and IND forms of the disease were detected with a probability of 83.3% among the same group and 100% of the cases were detected in the lepromatous form of the disease. The probabilities of multiplex PCR in RLEP-positive groups were represented in [Figure 1]. 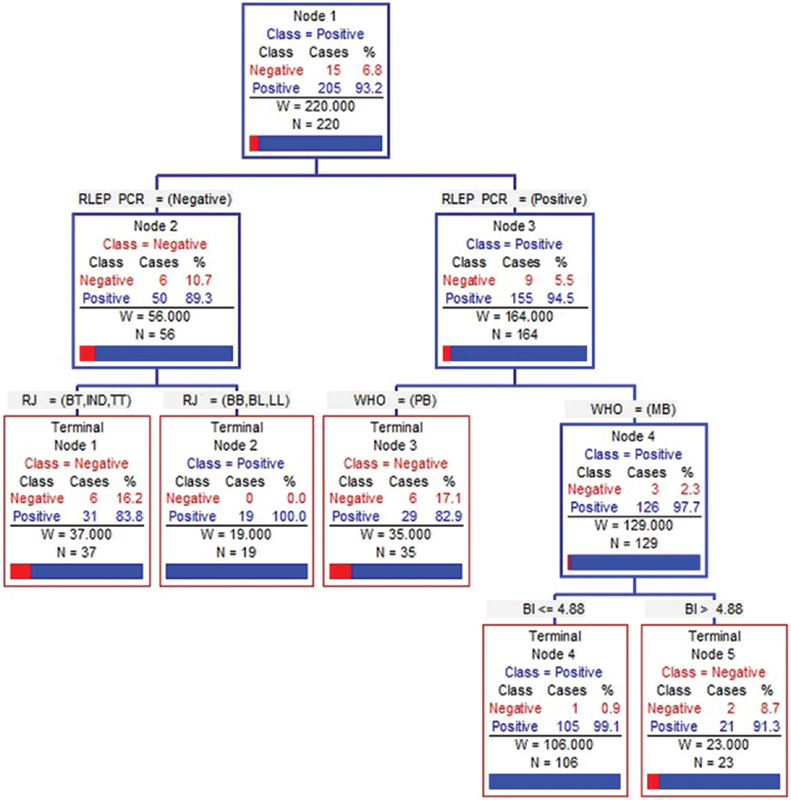 Figure 1: Decision tree indicating multiplex PCR positivity (classes (blue)) and negativity (red)) among RLEP negative and positive cases and cases stratified based on clinical outcome were represented. The probability of multiplex PCR positivity among each of the classes as stratified by CART algorithm was depicted. For the past two decades, PCR-based detection of M. leprae DNA in clinical samples has become increasingly important in the field of molecular diagnostics of leprosy. A potential PCR assay capable of detecting DNA as low as 3–6 fg with high specificity, corresponding to 1–2 M. leprae cells  in clinical specimens, is important for confirmatory diagnosis of leprosy cases, especially in the tuberculoid spectrum of the disease where clinical manifestations were limited. IND interfaces subclinical infection and overt disease in the tuberculoid spectrum, which is often an important phase through which an established infection is expected to pass through. This form of leprosy is considered to be the earliest manifested disease, which is known to be diagnosed by both clinical and histopathological investigations.,, Usually this form of disease does not show more than one lesion. By contrast, histopathological examination reveals mild infiltration of lymphohistiocytic cells around skin adnexa. It also shows endoneural and perineurial inflammation of very selective superficial and deep dermal nerves. Focal areas of epidermal erosion and spongiosis are likely to be noted in this form, and acid fast bacilli are not always detected. Hence, diagnosis of IND has always remained a challenge for leprologists as it presents very minimal nonspecific changes in the skin, and detecting acid fast bacilli in nerves is rather difficult as it might need a sufficient number of stained sections to be examined. While localized cellular changes in skin and nerve are an indication of a possible active infection, histopathological facilities and expertise that are required to identify this infection are limited to very few tertiary care leprosy centers in endemic countries. Dermatologists who treat leprosy cases with minimal and confounding clinical signs request for a PCR-based confirmatory diagnosis of leprosy (especially in tuberculoid and indeterminate forms). A skin biopsy specimen from the area of maximum sensory loss will be collected and sent to laboratories for DNA extraction and PCR amplification of M. leprae-specific genomic regions. Application of PCR for the diagnosis of IND indicated 50% positivity with PRA gene (proline-rich antigen) of M. leprae. Later studies indicated PCR positivity in urine samples of IND cases. In the present study, we determined 75.6% PCR positivity in DNA extracted from the paraffin-embedded skin biopsy specimens of IND cases using multiplex PCR and 58.5% using RLEP PCR. The multiplex PCR scheme that was developed is useful for M. leprae DNA detection from live as well as dead cells, and hence cannot differentiate the viability status of the bacilli. However, all the cases enrolled in this study were newly diagnosed untreated leprosy cases at the time of recruitment, ensuring that the detections were not merely from treated/killed bacilli. A robust PCR-based diagnostic tool that can detect early infection with high sensitivity and specificity is important not only for confirmatory diagnosis, but also as an early diagnostic tool, enabling clinicians to intervene with early treatment strategies to reduce nerve damage and subsequent deformities in leprosy. In the current study, we investigated a new multiplex PCR scheme with pseudogene regions in the M. leprae genome, which are highly specific for M. leprae, using a conventional PCR in comparison with RLEP, which is currently a specific and sensitive PCR target for diagnosis of leprosy. While it is known that RLEP gene amplifications correspond to only 30%–50% PCR positivity  in leprosy cases with a negative BI, the sensitivity of a 101 bp DNA sequence of the same, when investigated in the real-time PCR Taqman assay format, indicated 70.8% in acid fast bacilli-negative cases. Alternatively, multiplex PCR was known to enhance the detection limits of samples with minimal bacillary load in PB leprosy. A study by Banerjee et al. indicated that 80.3% of the patients with PB leprosy were identified by the multiplex PCR scheme involving amplification of the DNA sequences in the TTC repeat regions. Similarly, we observed 81.03% of PCR positivity with multiplex PCR in PB leprosy cases when compared with RLEP PCR, which is 60.34%. Although real-time PCR was performed to determine DNA detection sensitivity of the multiplex PCR scheme using standard DNA dilutions, experiments with clinical samples were performed only with a normal thermal cycler in order to determine the utility of this assay in a routine clinical/diagnostic setting. All the three genes in the scheme indicated positive signals for the standard M. leprae DNA dilution as low as 6 fg, indicating their capability of detecting DNA in at least two bacterial cells. However, determining the sensitivity of detection limit in the clinical specimens (in terms of real-time PCR-based quantification of bacillary load) is beyond the scope of this study. Further investigations are being carried out to ascertain the utility of this multiplex PCR scheme in effective diagnosis of leprosy using real-time PCR assays. Since this study is aimed at identifying a sensitive tool for the determination of M. leprae DNA in patient specimens, amplification of at least one of the three gene targets in multiplex PCR was considered as positivity, which might have enhanced the sensitivity of detection while retaining the specificity. Models based on machine learning methods and computational algorithms that can predict clinical outcomes of diseases and efficacy of various diagnostic tools have rapidly evolved in the past two decades., Decision trees that are constructed based on these virtual models provide comprehensive information on the influence of different variables considered to measure a specific outcome. In leprosy, this approach has initially been used to evaluate the efficacy of quantitative PCR-based assays for predicting infection in clinical specimens. Our observations indicated that various classes (clinical groups) predicted by the decision tree in the current study indicated a statistically significantly higher proportion of PCR positivity for multiplex PCR. Some of the limitations of this study include absence of real-time quantitative PCR experiments for all the patient samples to determine the sensitivity limits using critical threshold values and DNA sequencing of all the PCR amplicons generated in the study. These experiments will be conducted during further analysis of the findings. The current study was a pilot investigation of the efficacy of a new scheme of multiplex PCR assay using pseudogene targets in M. leprae for the diagnosis of tuberculoid leprosy and IND. Leprosy cases with early signs and confounding clinical presentations can be diagnosed with substantial specificity using the current assay. Further investigations are needed for quantifying the detection limits in clinical specimens. Pardillo FE, Fajardo TT, Abalos RM, Scollard D, Gelber RH. Methods for the classification of leprosy for treatment purposes. Clin Infect Dis 2007;44:1096-9. Thakkar S, Patel SV. Clinical profile of leprosy patients: A prospective study. Indian J Dermatol 2014;59:158-62. Liu TC, Yen LZ, Ye GY, Dung GJ. Histology of indeterminate leprosy. Int J Lepr Other Mycobact Dis 1982;50:172-6. Bezerra Da Cunha FM, Werneck MC, Scola RH, Werneck LC. Pure neural leprosy: Diagnostic value of the polymerase chain reaction. Muscle Nerve 2006;33:409-14. Rodriguez G, Pinto R, Gomez Y, Rengifo ML, Estrada OL, Sarmiento M, et al. Pure neuritic leprosy in patients from a high endemic region of Colombia. Lepr Rev 2013;84:41-50. Martinez AN, Talhari C, Moraes MO, Talhari S. PCR-based techniques for leprosy diagnosis: From the laboratory to the clinic. PLoS Negl Trop Dis 2014;8:e2655. Banerjee S, Sarkar K, Gupta S, Mahapatra PS, Gupta S, Guha S, et al. Multiplex PCR technique could be an alternative approach for early detection of leprosy among close contacts – A pilot study from India. BMC Infect Dis 2010;10:252. Sandhika W, Adriaty D, Agusni I. Detection of Mycobacterium leprae in formalin-fixed paraffin-embedded sample by Fite-Faraco staining and polymerase chain reaction. Procedia Chem 2016;18:231-6.
de Wit MY, Faber WR, Krieg SR, Douglas JT, Lucas SB, Montreewasuwat N, et al. Application of a polymerase chain reaction for the detection of Mycobacterium leprae in skin tissues. J Clin Microbiol 1991;29:906-10. Sundeep Chaitanya V, Das M, Eisenbach TL, Amoako A, Rajan L, Horo I, et al. Mycobacterium leprae specific genomic target in the promoter region of probable 4-alpha-glucanotransferase (ML1545) gene with potential sensitivity for polymerase chain reaction based diagnosis of leprosy. Int J Mycobacteriol 2016;5:135-41. Turankar RP, Lavania M, Chaitanya VS, Sengupta U, Darlong J, Darlong F, et al. Single nucleotide polymorphism-based molecular typing of M. leprae from multicase families of leprosy patients and their surroundings to understand the transmission of leprosy. Clin Microbiol Infect 2014;20:O142-9. Vedithi SC, Lavania M, Kumar M, Kaur P, Turankar RP, Singh I, et al. A report of rifampin-resistant leprosy from northern and eastern India: Identification and in silico analysis of molecular interactions. Med Microbiol Immunol 2015;204:193-203. Yan W, Xing Y, Yuan LC, De Yang R, Tan FY, Zhang Y, et al. Application of RLEP real-time PCR for detection of M. leprae DNA in paraffin-embedded skin biopsy specimens for diagnosis of paucibacillary leprosy. Am J Trop Med Hyg 2014;90:524-9. Rutkowski L, Jaworski M, Pietruczuk L, Duda P. The CART decision tree for mining data streams. Information Sciences. 2014 May 10;266:1-5. Lewis RJ. An Introduction to Classification and Regression Tree (CART) Analysis. In: Proceedings of the Annual Meeting of the Society for Academic Emergency Medicine, San Francisco, CA, USA; 22-25 May, 2000. p. 1-14. Pal SK, Amita P. Pattern recognition: from classical to modern approaches. Indian Statistical Institute, Kolkata, India; World Scientific; 2001. Kohavi R. The power of decision tables. In: Lavrac N, Wrobel S, editors. Machine Learning: ECML-95. ECML 1995. Lecture Notes in Computer Science (Lecture Notes in Artificial Intelligence). Vol. 912. Berlin, Heidelberg: Springer; 1995. Truman RW, Andrews PK, Robbins NY, Adams LB, Krahenbuhl JL, Gillis TP. Enumeration of Mycobacterium leprae using real-time PCR. PLoS Negl Trop Dis 2008;2:e328. Nayar A, Narayanan JS, Job CK. Histopathological study of early skin lesions in leprosy. Arch Pathol 1972;94:199-204. Ridley DS. The pathogenesis of the early skin lesion in leprosy. J Pathol 1973;111:191-206. Lucas SB, Ridley DS. The use of histopathology in leprosy diagnosis and research. Lepr Rev 1989;60:257-62. Takahashi MD, Andrade HF Jr., Wakamatsu A, Siqueira S, De Brito T. Indeterminate leprosy: Histopathologic and histochemical predictive parameters involved in its possible change to paucibacillary or multibacillary leprosy. Int J Lepr Other Mycobact Dis 1991;59:12-9. Wichitwechkarn J, Karnjan S, Shuntawuttisettee S, Sornprasit C, Kampirapap K, Peerapakorn S. Detection of Mycobacterium leprae infection by PCR. J Clin Microbiol 1995;33:45-9. Caleffi KR, Hirata RD, Hirata MH, Caleffi ER, Siqueira VL, Cardoso RF. Use of the polymerase chain reaction to detect Mycobacterium leprae in urine. Braz J Med Biol Res 2012;45:153-7. Turankar RP, Pandey S, Lavania M, Singh I, Nigam A, Darlong J, et al. Comparative evaluation of PCR amplification of RLEP, 16S rRNA, rpoT and Sod A gene targets for detection of M. leprae DNA from clinical and environmental samples. Int J Mycobacteriol 2015;4:54-9. Reja AH, Biswas N, Biswas S, Dasgupta S, Chowdhury IH, Banerjee S, et al. Fite-Faraco staining in combination with multiplex polymerase chain reaction: A new approach to leprosy diagnosis. Indian J Dermatol Venereol Leprol 2013;79:693-700. Tanner L, Schreiber M, Low JG, Ong A, Tolfvenstam T, Lai YL, et al. Decision tree algorithms predict the diagnosis and outcome of dengue fever in the early phase of illness. PLoS Negl Trop Dis 2008;2:e196. Shouman M, Turner T, Stocker R. Using decision tree for diagnosing heart disease patients. In: Proceedings of the Ninth Australasian Data Mining Conference. Vol. 121. Ballarat, Australia: Australian Computer Society, Inc.; 2011. p. 23-30. Martinez AN, Ribeiro-Alves M, Sarno EN, Moraes MO. Evaluation of qPCR-based assays for leprosy diagnosis directly in clinical specimens. PLoS Negl Trop Dis 2011;5:e1354.